I wanted to start a new monthly series here on the blog. 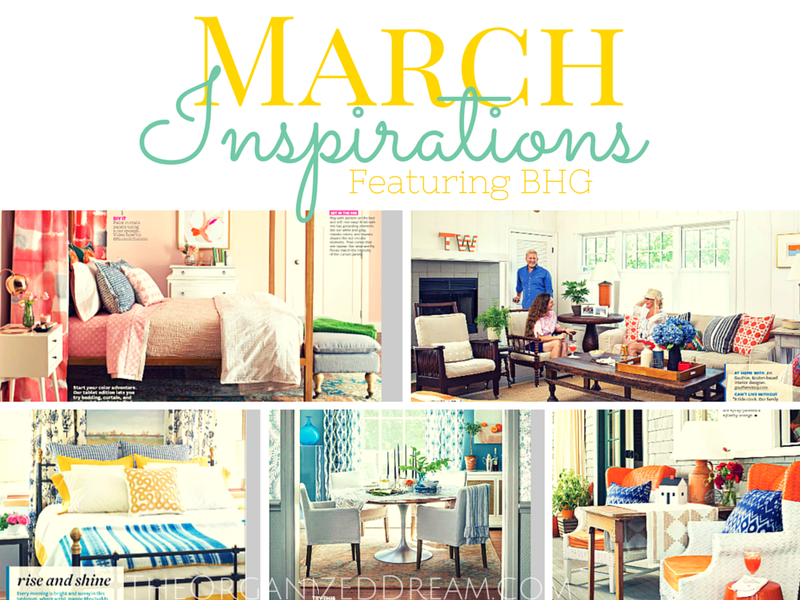 This month, these inspirations come from Better Homes and Gardens. I've recently subscribed to this magazine after not reading for a few years and have since fell in love with it all over again. 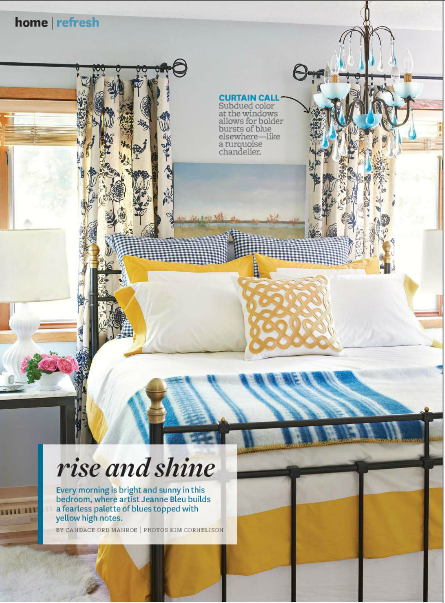 This month's issue is all about Spring and color! We've had a terrible Winter here in New England and these rooms inspired me to start my Spring cleaning. I can't wait until the warmer weather! You'll notice, orange is featured in all of these rooms. It's definitely something different. This room has a great nautical feel and feels light and airy. I love the lobster! This porch is beautiful. 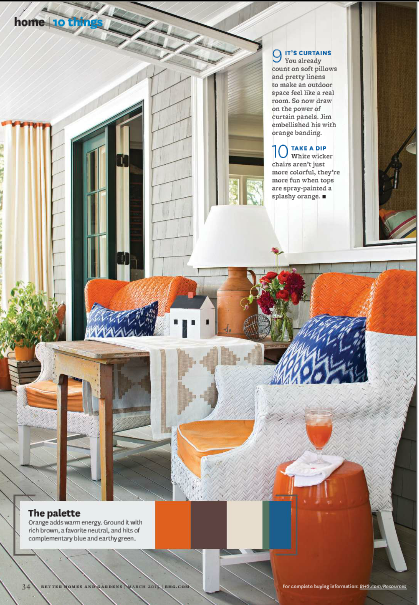 I'm typically not one for orange, but I heart these chairs (especially with those blue pillows) and those windows are perfect! I love the gold-yellow hues with the blue. This room feels open and inviting. Since I've incorporated yellow in my bedroom already, I need to find some blue pieces too! 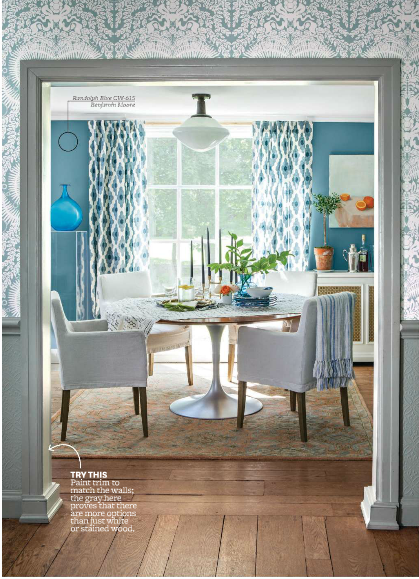 I love the look of this room with the different patterns, shades of blue and hints of orange. Definitely something to want to eat breakfast at everyday, am I right? I'm a sucker for pink. I think this room could be a little juvenile for my tastes, but the hues are beautiful and easy to incorporate into a room using smaller pieces. 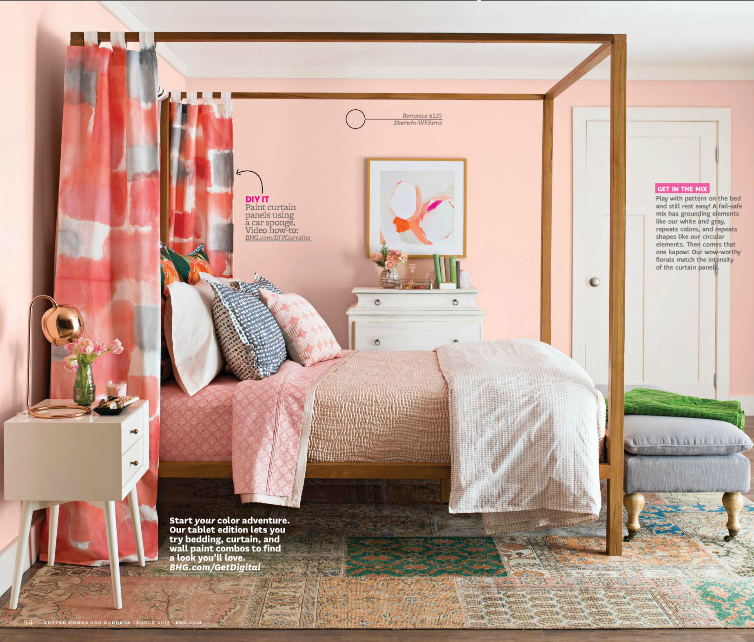 You can find these room inspirations (along with a few tips and DIY tricks to recreate each look) recipes and more in the newest issue of Better Homes and Gardens. I love the porch with the orange chairs. I wish I was enjoying my morning coffee there right now! I know, right? I love that one! I love that first bedroom! 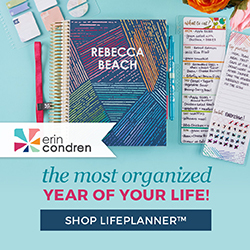 I live in Florida, so it obviously hasn't been particularly cold for me, but it's been a hard winter in other ways and I'm so excited for longer days, spring cleaning, and all the other good things that come with the warmer months! I can't wait to spring clean and open the windows! It's been sooooo cold! The colors are amazing in that bedroom! I love these looks, especially the last coral look! I can't wait for spring to come so I can start reorganizing my space! So pretty, right? I love pastel colors. Thanks for stopping by! Love the rise and shine. That's an eye opener. I can't wait for Spring and these inspirational rooms are a ray of sunshine. I look forward to reorganizing my house and repurposing existing items to give each room a bit of a facelift each Spring. Thank you for sharing! Such gorgeous spaces!!! I love all the orange! Beautiful ideas. Love the color scheme on the porch! I love that bedroom. The colors are just so happy! Great inspirations but that lobster would freak me out, lol. Thanks for linking up at Thursday Favorite Things, please visit us again next week! I love these! Where are you in New England? I'm in Maine and I agree, we need some color and beauty right about now!! I'm in Rhode Island. It's still cold here but we're really excited that Tuesday will be a whopping 46 degrees! Woo Hoo! 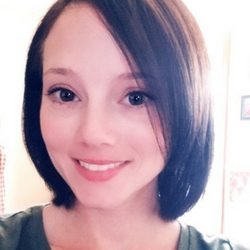 Thanks for stopping by, Nicole! I love the mixes of colors, patterns, and textures in these. I'm itching for a change and love the nautical/beachy looks.